While most of the tarpon were "peanuts", fish in the 5-40lb range, there was (and still is) a pile of them!! A colleague of mine, fishing by himself, put 86 fish into the air in one tide change. 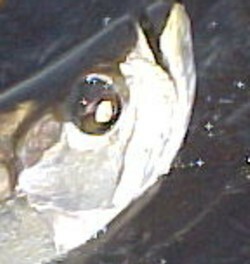 I sent another 18 tarpon aloft, most on fly gear, on another day. Most anglers have been able to jump three to four fish per trip, in addition to the other fish on their species list. This pattern should hold well into December … at least I hope so. I do love catching these tarpon-ettes. 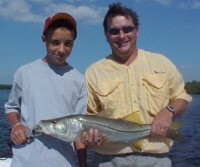 Typically, we fish inshore in the morning for snook, redfish and tarpon. If things are right, I like to sight fish in the shallows. Seeing the fish, sneaking up to it and watching the fish eat your bait is a real blast!!. Once (or if) things slow down inside, we will ease out to the near shore structure, most of which is within sight of land. While there are big snook and permit around, you can count of the cobia, mackerel, blue fish, and the snappers and groupers. Between these species and the assorted jacks, blue runners, ladyfish, sharks, etc., it common to catch over a dozen different species on most trips … December’s Winter Mix. As the water cools, the plankton and algae life dwindle so the water really clears up. Sight fishing becomes more and more attractive to we light tackle advocates. In the cooler times, the fish will “lay up” in the shallow sun-washed, water. These shallows warm up first with the rising sun, so the fish are there warming up also. Sight fishing these laid up fish is something every fisherman should experience. It takes a bit more skill and finesse, but the rewards are great. The Everglades fly fishing has really picked up. Both snook and redfish have been eating well. An occasional tarpon in the pile spices things up quite a bit. Glass minnow flies tied by John Driscoll of Toxic Shark have been producing well. 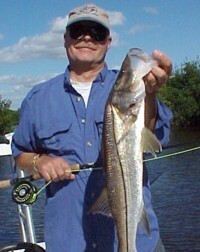 Andy Novak's (LMR Fly shop - Ft. Lauderdale) orange headed snook fly has been producing bigger fish in the creeks, however. A recent trip to the near-by structure turned out to be an absolute blast. Blue fish, Spanish mackerel and 4-5lb lady fish were everywhere. Hardly a cast went by without hooking a fish. These lady fish were a hoot on fly. With the assist of the fly rod, they were jumping eye level. While not the most prestigious fish on the list, two hours of non-stop, drag pulling action on fly, ranks right up there!! If you haven't tried it you should!!! If you are into something a little different, I will be running several kayak fishing trips deep into the backcountry on the weekends this winter. Fear not, we are going to load up the yaks on a larger boat so we do not have to paddle for two days to get to the fishing grounds. Ride in, fish, grilled lunch on the boat/beach, fish, ride back. These trips should be a good time. Watch the website for the up coming trips. 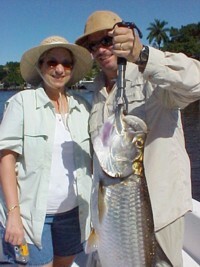 Also, the spring and summer tarpon trips are booking fast. If you have an interest in watching these dinosaurs do their sunset aerial act, I would suggest that you let me know soon. call him @ 239-695-9107. Tight Lines! The Tarpon have continued to pound the baits. I had the opportunity to fish one of the remote creeks two days ago ... The wind was howling from the NE @ 20-25 so we were going to have to fish sheltered waters no matter what. The wind was blowing the water out of the back country fast so the current was rather strong. However, we staked out the boat at an intersection of two streams of water. It took just 10 minutes for the action to start ... We put 18-19 tarpon into the air right there in that spot ... seven went up on the fly rods. Lots of snook were mixed in, but this day, they were incidental "by-catch" ... what a time. All of the fish were the smaller creek fish, but they were a blast!!! The following day, the fish were a lot bigger ... a lot bigger ... Two more hit the horizon along with six nice snook and a redfish. Yesterday, the wind shifted with the passing low. I headed out with my wife in the afternoon to scout things out ... the wind shifted and so did the concentration of big tarpon ... It was quite a run ... I am actually looking forward to it blowing again ... I think. I must be nuts! It he last report, I said that "November is going to be great!!!" 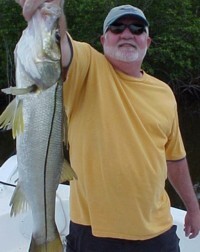 Oh yeah, the snook are still biting strong also! If you would like to book a charter with Chokoloskee Charters, contact Capt. Charles Wright @www.ChokoloskeeCharters.com; (chokoloskeecharters@gmail.com) or call him @ 239-695-9107. Tight Lines!